My second grade daughter and her friends wanted to do a group costume- we were having a hard time finding something age appropriate. We used a collapsable laundry basket upside down. After cutting out and gluing the Slurpee cup design to yellow felt we then glued all that down- we then wrapped the yellow around the laudry basket and attached it with spray glue. We then cut the arms and head into the costume. Using pillow stuffing we spray painted their favorite "flavor" and then attached that to the top using spray glue. The straw was made from an old curtain rod, spray painted red and striped with athletic tape- we wired these in place. These girls rocked! Awesome costume! Awesome! Cute, colorful and creative! 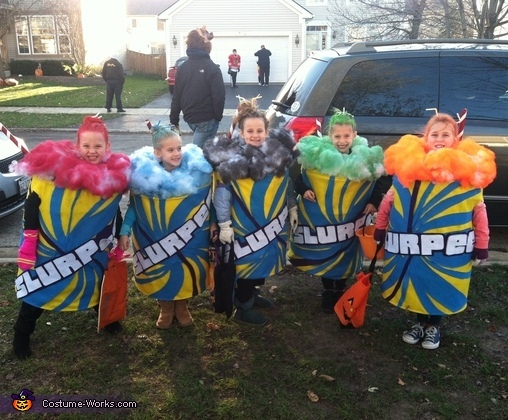 found another slurpee costume-way too complicated! this looks no differnt and saved us lots of $!!! !